Tuesday, 30 July 2013 By Marchetto Pellami S.p.A.
Aniline leather: natural, velvety and the most valuable. By Marchetto Pellami. Do you like aniline leather? It is the most natural-looking leather; it is smooth and extremely soft. “For this particular process, the best selections of raw hides are chosen”, explain the experts in Marchetto Pellami, “because, being a full-grain article, all the features of the animal coat are highlighted”. It maintains a very natural aspect, which is extremely appreciated by those who prefer ethnic chic but also very modern furnishings for their home. Aniline leather is more sensitive to light; it does not have to be directly exposed to sunlight in order to keep the original colour bright over time. This process is unique and delicate: the leather is only drum dyed and sometimes it undergoes a waterproofing treatment to improve its resistance to stains. The finishing is absent or very light and transparent to keep both leather characteristics and colour unchanged. Particularly conceived for enthusiasts of valuable and refined aesthetics, aniline leather is often used by the most exclusive and upscale footwear industry and by the finest furnishing industry. Pic: Sofas featuring a soft and embracing aesthetics are current examples of uses of these valuable leathers. 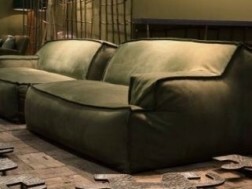 Damasco Sofa by Paola Navone for Baxter.